What’s your first thought when you hear the words Mardi Gras? Do you think Bourbon Street? While that craziness might be what makes the national headlines each year, that’s not the whole story. I just got home from celebrating Mardi Gras in Louisiana, and the experience shattered my stereotypes! In fact, I think if we all adopted a little Mardi Gras culture, the world would be a far friendlier place! 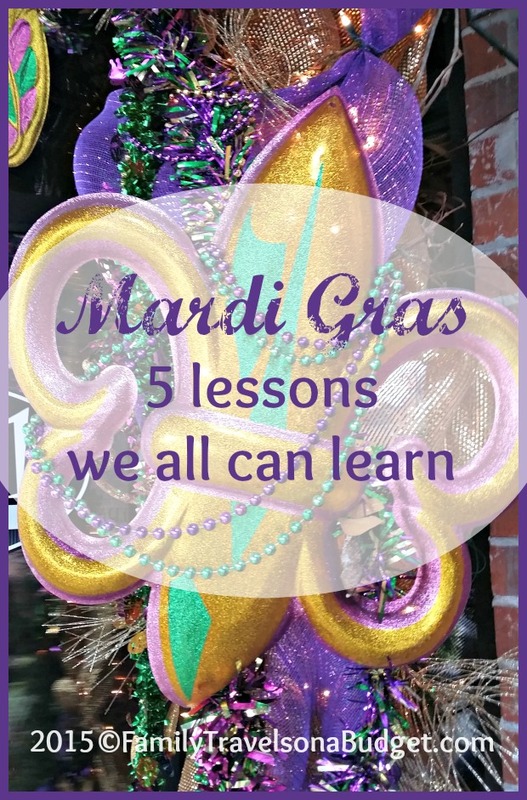 In no particular order, here are five lessons we all can learn from Mardi Gras. Tradition matters. Thousands of years ago, before papyrus and the written word, history was preserved through storytelling and tradition. Today’s Mardi Gras, especially the Chicken Run festivals throughout rural communities, preserves tradition going back to the middle ages when the poor would run from landowner to landowner asking for provisions to make gumbo. The landowner would offer chicken, pork, onion and other ingredients to these masked marauders. 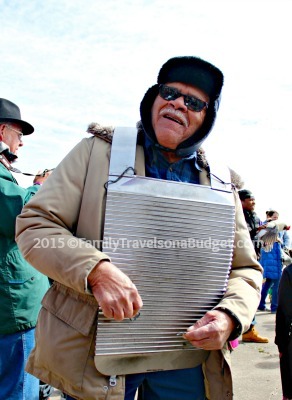 Today’s tradition continues much the same way, with zydeco dancing, chicken chasing, masked fun that entire communities enjoy. Community counts. After reading that, maybe you’re not surprised to hear that community counts in Louisiana. Mardi Gras brings large groups together — not just in January and February, but throughout the year. Planning parties, fund raisers and other events build camaraderie, and then, throughout Mardi Gras it’s one big celebration of community and connectedness. Imagine if the rest of us knew our neighbors that well! Family rituals. In Louisiana, boudin and gumbo are king! So is zydeco. But above all is family! 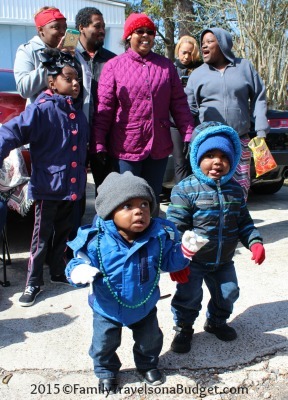 The littlest mardi gras revelers learn it all as grandparents, parents, aunts, uncles and cousins join in, just as they have for hundreds of years. Louisianians don’t seem interested in catered meals — it’s the real deal around these parts — and the kids love every bit of it! Laid back attitude. I don’t know if I can say one of these lessons is more important than the other, but if I had to pick one, this is it! Mardi Gras floats and costumed revelers might be elaborate, but the celebrations are low stress! Forget the Pinterest-worthy centerpieces molded out of sugar paste and imported feathers. Just toss some Mardi Gras beads in the middle of the table next to the hot sauce and napkin pile and call the party palace ready. Most people have beads they’ve collected through the years and costumes worn with age, but still so festive. In Louisiana, people understand what’s most important and impressing the neighbors with fancy decor ain’t it! Laissez les bons temps rouler. Of course, when you combine centuries of tradition with close-knit communities and even tighter bonded families who know what matters, it’s easy to let the good times roll! I’m not surprised that Louisiana is home to the happiest people in the United States. They aren’t worried about keeping up with the Joneses, they just love ‘em! This year I promise to love more and fuss less. I promise to live more in the moment! I promise to focus on what really matters and let my inner Louisiana shine! Laissez les bons temps rouler, today and every day. World, why not join us? looks like a great experience. Thanks for taking a different POV on mardi gras. What a great perspective on Mardi Gras. I agree that the world could use more of this. I have never been in to any Mardi Gras & it is a bit new for me. But I love that adopting a Mardi Gras culture a bit could make the world a more friendlier place. I love all those pictures & video that explores tradition in a great way. Thanks for sharing. I love Mardi Gras! It encompasses all things fun and traditional! Love this, especially the laid back attitude that encompasses Mardi Gras! Yay low stress, and so much fun! I imagine that there could be many horrible things that could happen at a mardi gras, but it seems like because it’s a tradition and a lovely way to celebrate and just get together, that it’s just that … “getting together.” Thanks for this enlightening post. Very interesting read! I had no idea that the occasion consisted of such a wide range of events. Sounds like loads of fun for everyone! Thanks for the fun post! Going to Mardis Gras is on my bucket list. How fun! Do you know how it began? I think Bourbon Street when I hear Mardi Gras! But I also am aware of the traditions and would love to visit that state for Mardi Gras! Erinn, Lake Charles is just a two hour drive from the Houston airport — easy drive! Lots of hotel options and a full schedule of activities beginning January 6. If you decide to go, I can send you some restaurant and hotel recommendations. The boys would love it! Great legends and lessons. Looks like tons of fun. Where I live people really don’t know about Mardi Gras, but it looks like so much fun to celebrate! Tee hee! That’s true where I live too (North Carolina). Raleigh has a Mardi Gras event, but it’s nothing like Louisiana’s celebrations statewide. I haven’t participated in Mardi Gras. You pointed out some great points. I think it is important to keep passing along family traditions. I want to love more and fuss less too! I find myself fussing a lot and try to stop myself. I also agree with you about tradition and community. I finally am able to have a little bit of both at this stage in my life. It’s a great season to be in, isn’t it? Hold on to those things. It only gets better! How’s the Mardi Gras food? 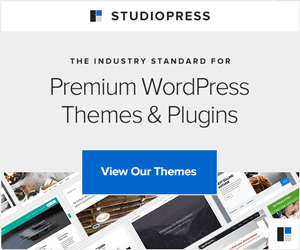 Are there special edible traditions as well? 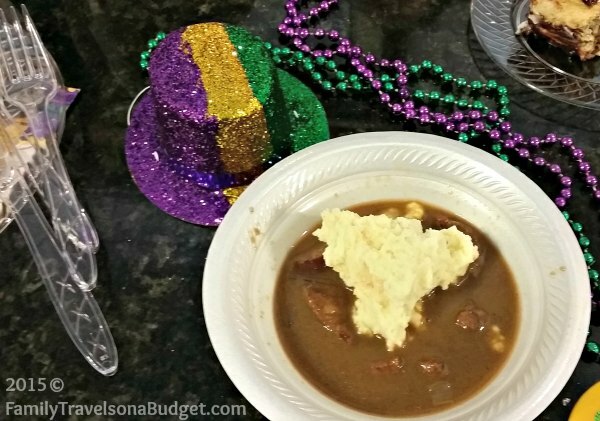 Boudin (which is sort of like a pork and rice sausage — sort of), King Cake and Gumbo are king! I’ll be writing on boudin in the next couple of weeks, so stay tuned! This is part of the bucket list.. we were thinking of going next year.. lets see! 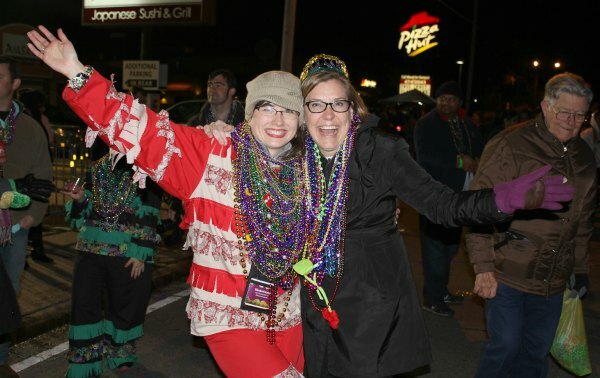 I’ll write more on Lake Charles Mardi Gras in coming months, but FYI: It is loads of fun! It’s cheaper than NOLA by a ton! AND, it’s an easy drive in from Houston airport. Great for international travelers. I have never been to Mardi-Gras and I’m so envious, lol. Thanks for sharing your photos, I love all of the colored beads. I could sure make some crafts with them. The Lake Charles area recycles beads to raise money to support autism and services for the autistic. It’s a wonderful community.